Seismologists express earthquake size in units of magnitude. Magnitude is obtained from instruments called seismometers that measure motions of the ground. The Moment Magnitude Scale is commonly used to measure the size of earthquakes. Using the Moment Magnitude Scale, earthquake size is given in terms of the energy released based on the seismic moment of the earthquake. The seismic moment is equal to the rigidity of the Earth times the average amount of slip on the geologic fault and the size of the area that slipped. The Moment Magnitude Scale was developed in the 1970s to replace the Richter Scale. Magnitude is expressed on a base-10 logarithmic scale. An earthquake that measures 5.0 has a shaking amplitude 10 times larger than one that measures 4.0. Each whole number increase in magnitude represents a tenfold increase in measured shaking amplitude. Each whole number increase in magnitude corresponds to an increase of 32 times the amount of energy released. The USGS How Much Bigger Calculator is an interactive tool that shows difference in the intensity and in energy released between two earthquake magnitudes. Human fatalities from seismic events depend on the magnitude and depth of the event and the proximity of the epicenter to concentrations of human population. 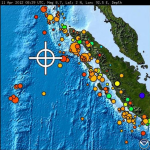 Off-shore Earthquakes, volcanic eruptions and other underwater disturbances can cause a series of waves, or tsunamis, that can be destructive to on-shore populations.